If you'd like to use the web-based IRC client, click on "WebChat" above. Be sure and change the "Nickname" field to something that makes more sense; for example, your hero name or the name you post under on Jaiku or feebleforce.com. 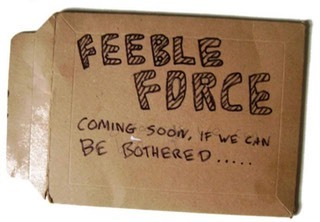 In the "Channel" box, enter "#feebleforce" (without the quotes). If you would rather set up a dedicated IRC client on your computer, use "irc.borgchat.net" as the server, and connections on ports 6660-6669 are accepted. If your IRC client supports it, add the channel "#feebleforce" to the "auto join channels" list. Otherwise, type "/join #feebleforce" (again, without the quotes) as soon as you are logged in to join the Feeble Force channel. Any further questions; check out the Help page or contact an IRCop.